"I do not want to live in Strauss’ time, I want my I-Phone"
Here are some excerpts from the interview with André. 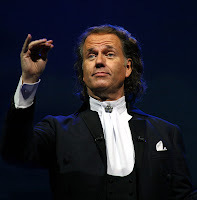 Maastricht citizen André Rieu is world famous from Appingendam to Adelaide. He draws full halls and stadiums around the world. With a large orchestra, beautiful costumes and an occasional wink, Rieu re-introduced classical music to the millions. Rieu gives his public a warm feeling, a hint of romance and makes it laugh. In the year 2008, he sold 27 million CD’s and DVD’s. Rieu’s organization from Maastricht to New York, entails 150 employees. 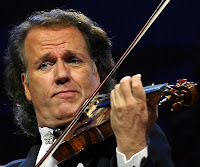 André Rieu productions, is a mini multinational organization. And all the reigns come together at the violinist-conductor-entrepreneur. Are you an entrepreneur or a musician? Of course a musician. The entrepreneurial side comes naturally. But together they go along real well. My great example is Johann Strauss. He was a very gifted and brilliant musician, composer and the first pop-star in the world. And also a very cleaver businessman. He was rich, owned five orchestras, and I only have one. I can not see why the two can not go together. And why it has to be one or the other. When, for the first time did that come together, musician and entrepreneur? "Gee, when did that start? You learn it little by little, I think. I started small. With a Salon Orchestra with five people. I was also a member of the Limburg Symphony Orchestra (LSO). That was in the year '80. At that time there was also a credit crisis, and rents were increasing. We might have had to leave our home. But the Salon Orchestra saved me from that then. Because of it, we could continue to live there. I brought home about 800 guilders. Hooray, that was quite smart for a violinist. You could have gone in a different direction though. You could have become a conductor, violinist or soccer coach for instance. It is within my character that I like to lead and also play at the same time. Especially the latter. My father was a conductor and I looked at the soloists. All of them lonely people in a sense, who had learned a few concerts verbatim. Not that I do not agree with that. I have an enormous respect for them, but do not want to lead such a lifestyle. I knew that than. I also knew that when I was a small boy, and I would marry a woman who wanted to work with me. We do all of this together. My wife Marjorie is the daughter of a Jewish hat merchant who fled Berlin and married a Maastricht girl there. Every one says," Your wife conducts all the business, but that is not true. She most definitely also has a musical mind. It is nice that she can use her business instinct with that". You have consciously not entered in your father’s footsteps and become a director of a regional orchestra such as the LSO. That would be horrible! Than you are stuck with unions and the like. Seems to me like a disaster. All those people becoming ill. That is very bad. Not only in Maastricht, but with all the symphony orchestras. All so prim and proper. No, not at all easy. According to me it is a horrible, rising dead end road in which classical music has let itself be pushed into a corner, because it is something special. It was not like that at all during the times Mozart, Hayden or Verdi. Then, music was for everyone. And now? Just go to a concert building, and those who purchased a season pass, are the ones who have to show off their new dress. Like: I am also a partner with PwC, so I have to show that I too enjoy culture (laughs). Something like that. Of course. And I had to learn everything. We lived in Belfort (a district in Maastricht), in an apartment. I had pasted twelve letter size pieces of paper against the wall. Those were the months. So I annotated all my performances on those. But at a certain moment that became too much. It was the same time that Marjorie left her position at the school because she did not want to teach any longer and went into translating. That is when I told her: "I will help you". And ever since then we do everything together. All the way from the beginning with the Salon Orchestra. One day, someone from Friesland (one of the most Northern provinces in the Netherlands) called me, "Can I come and perform there?" "Yes." But Marjorie said "everything in Friesland is so expensive, because it is so far away". That performance of course did not take place, but we learned from it. Did you run into any walls? Any regrets on certain decisions? No, not at all. It is so nice that I was able to build this all by myself together with Marjorie. I do not have a manager, never had one. I do not have an agent any more. We had one, but we threw him overboard. We wanted to be free, we ourselves wanted to determine what we wanted. I have also given myself the time to become famous. Silly word actually, "famous", really what is it to be famous? Now a days, a lot of groups are formed by managers, and they create an idol like situation. They soar to the top, sell millions of CD’s and a year later they have vanished from the surface of the earth and have nothing to show for it. I have done it all by myself. Isn’t it a difficult profession, entertainment and musician? Not at all. All along I have done what I have wanted to. Of course a lot happens. Than there once was an agent from America who said, "I will have to tell you what you have to do. You have to put on a glitter jacket, play this and that music, and blah blah blah. Right away I told him, "Thank you and so long". No one tells me what I have to and not have to play, and I am successful. I know for sure that if an agent came by here, he’d try to sweep the floor with me. That is what agents are supposed to do, to become influential. That’s how it goes. And what do think about all those lawyers? They chop you to pieces. And they tell you, "You need me, because I can make you famous, just give me 20% of your earnings". That’s the way the lawyers do it, and that is not how it should be. Do you ever present your plans to a professional advisor? I have my intuitions and Marjorie. She is my sounding board. And there are my sons also. We listen to one another, that is very important with all those money hungry wolves around. Naturally I have a good team around me. Above all, we are expanding. You have to experience it. I think that an entrepreneurial venture in large part is experience and intuition, and loving your people. All entrepreneurs are involved with people, otherwise you are not an entrepreneur. You should not be a boss if you can not get along with people. That is really important. How did you handle that throughout the years with people who do not click, do you go your separate ways? They leave very quickly. If for instance, I hire a musician and in five minutes say, "Join us on tour", we’ll notice it real soon. Earlier I did it differently; I spoke with them a lot longer. Would it go alright? There is a three year rule, and if a musician has been with someone for three years, you offer him a permanent position. And in three years I can tell whether someone clicks or not. Most of the time that happens a lot sooner. And at the office it is the same way. Rieu shows his smart-phone. "See. I receive all my mails here. Right now for instance I am very well known in Australia. That is in a different time zone. Let’s see if we are still number one (checks his mail) NUMBER ONE AGAIN!!! YEAH!! (Gets up from the table, looks at his musicians who after the concert are having a snack and something to drink) Ladies and Gentlemen, we are again number in Australia. (Fist in the air, applause and cheering from his people, and Rieu laughs) He sits down and yells, "Yahoo!!!!" "That is not bad. See that just came in, I can respond too. I have the ability that no matter where I am, I can work or sleep whenever I so desire. Is that because you determined where to draw the line and that everything is maintained in your head? You are in the middle. "I am in the middle. You do not need to do much in order to be there. If you are at an extreme end, you need long cables, but in the middle you only need to direct. More than half the orchestra members have been with me for more than fifteen years. I am extremely proud of that. And at the office, I think it is the same. They like it. Just this year alone, six babies have been born to my orchestra members. That is quite something. With fast growing organizations, things can go wrong. "Yes, but you have to watch out for those things. For a long time now I have been performing 120 concerts per year. Than you run into something, which you think is just routine, but it is not. But I keep thinking, "Something is going to happen". I called Marjorie and told her, "I want to do fewer performances. But we still have to feed all our people, so we have to do things on a larger scale". Rieu starts to talk about something else. He teases the author of this book a little, who lives less than a kilometer from Rieu in Maastricht. Instead of crossing the Maas, the author flew across an ocean in order to speak with his neighbor. 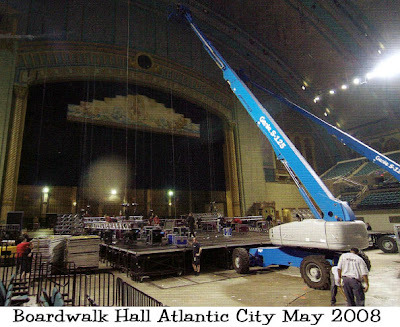 Place of the meeting: Atlantic City towards the end of May after one of his concerts. Neighbor from the other side of town. "Nice that you came here. Because you have said, "I go all over" and than later you said, "Could this have taken place in Maastricht?" (Laughs) I am really busy. During our tour here in America, I am completely motivated to do this with you. And it gives you more time too. Otherwise if I had been in Maastricht, I would be sitting next to Marjorie. That’s why I think it is so nice to do this interview here. He than picks up where he left off. About less but larger performances. We then copied the Viennese castle "Schönbrunn". Now who would copy Schönbrunn? But than of course in true scale of one-on-one. I played there the summer two years ago (2006). We taped the performance there for the German Television. I thought that evening was so nice. Here comes the intuition of the entrepreneur again. From ZDF (German TV station) I always received an amount to do a special. Do not really call it an amount, but I have to produce a special for it. This special costs me more than I received, but I did not think about the money then. I thought Hey, wait a minute you guys. I felt it, This has to be beautiful. This will be something. And it turned out just like that too, and also in the responses of the audience. ZDF told me, "You will have to do this every summer". I told Pierre (his son) after I had talked with Marjorie That I wanted things bigger, but less performances. And with the success in Australia, it all plays a roll. Than you are no longer an entrepreneur, you gamble. This was an extreme gamble. Just ask the Rabobank (Laughs). They helped me. The bank did not want to finance you directly. Was that difficult? It was quite difficult. The bank at first made me out to be a fool. I do not only have blue eyes, but I also have a track record. The financial proposition went to Utrecht (headquarters of the bank) and they said, "We’ll do it". When Rieu wants something, he latches on. He misses that determination by others more and more. Perseverance is a trade you need to have as an entrepreneur. And you have to maintain tight reigns. That is very important as an entrepreneur. Did you expect that enormous success in Australia? Maybe it sounds a little dumb, but I did expect it. I had anticipated it. I know that. The same as to what happened here tonight. I know I can do it. I know we can do it. Do you base that prediction on market research? No, I know what I can do. It is in my genes. I know I can play a hall my way just like Toon Hermans (Dutch comedian) did in the past. He did not do market research either. But that was Toon Hermans and he knew it. As soon as he appeared on stage the audience would start to laugh. They laughed so hard, they wet their pants even before he had said anything at all. Toon Hermans did not have managers either who told him: "You have to do things this way". What does that enormous success mean? And how as a company do you continue? That success in Australia is one of the reasons I got the bank to assist me with the millions it cost to copy the Schönbrunn Castle twice. Since the distances in Australia are so enormous, it could not have been done any other way. When we did the first Schönbrunn Castle show in Toronto, the entire crew cried. Where else can you experience something like that, yes, where else can you experience that? I will just mention the Limburg Salon Orchestra, but I think you can mention every symphony orchestra, and with them it is just a boring event. And I think the same is true in a lot of organizations. If I were to be prime minister, I would ensure that every one would again find pleasure in their work. How do I do that? Funny question. Two years ago there were some enormous soccer riots in Rotterdam. Newspapers were filled with them. At the same time there were Senate debates on television. And then there was Balkenende (Dutch prime minister) and I had no idea what he was speaking about. It was horrible as to what was going on over there. They destroyed the inner city. If I were the prime minister I would have said, "In a small way I am the father of this country, so ladies and gentlemen close your note books, and let’s talk about those riots from last night." Barend and Van Dorp (ministers) said that evening, "Wow, all those soccer riots, there is nothing we can do". But than I think, "Can’t do anything about them!! What do mean?" Am I right or not? You are not talking about the demography or whatever, you are discussing the reactions needed as to what is transpiring. He is totally in his right. He is the prime minister. He can say, "Let’s not discuss the educational system, traffic back-ups or whatever", he can say: "Just stop it". Did you hear this? I heard it from Marjorie. A mayor in a small village said this and it touched me, "All traffic lights and all traffic signs need to be elimintated, and every one needs to learn again to be responsible for themselves. I am in total agreement with him. It is really bad. And the funny thing is that every one thinks so too. They are making a Madurodam (miniature village in The Hague) out of the Netherlands. And you know how many millions that will cost? Stop all that and those with their very liberal education. I spoke with a couple of Americans on their way to a concert and they said, "André Rieu brings back the past. That is really crazy. I was just thinking the same thing this evening. I saw all those happy people there, I saw them all waltz and dance. They often ask me if I would like to live in Strauss’ time. No, never, ever. I need my I-phone. But I think those were better times, with shorter reigns. Now-a-days there are so many without interest. No one really cares any more. It is unfortunate. A small example. My orchestra members would crawl on stage, even if they were ill.
Hermans, Joop van den Ende (an enthusiastic man) and Herman Krebbers as a violinist. Do you have any professional sparring partners? No, I do it alone with my family. Aren’t you two too much on top of another? Marjorie and I? Don’t make me laugh. It is really true, we do not even have to speak, but we typically think the same things. Of course you can say, "How boring". But than on the other hand you can also say, "What a blessing". And it is the same with our boys too. How will all this continue? In an interview you said you will live to be 120. Any plans of going public with your company? But you are very business like. Is that because of your success, or is it because of the money? Did you have to worry about it? No, I made it a reality. I worked very hard for that. Next year is already booked full. The Schönbrunn Castle has yet to begin. I’ll travel the world over with her for the next ten years. Thank You to Ruud and Ineke for finding this and John for Translating it! !